My Halloween fun continues! I’ve mentioned before that I love hummus. I eat it all the time. And I didn’t even know that it has a low glycemic index. I just found that out this week. One thing I don’t love in hummus though is an overwhelming amount of garlic. This hummus is mild but has a rich flavor because I roast the garlic first. Roasted garlic adds so much depth of flavor and you can use the remaining garlic cloves to create a second easy dip for your party (see the instructions under my recipe). I served it to company last night and they loved it. You can make a little sign on a toothpick so guests know what they are eating. I love doing that at parties. To roast the garlic, preheat oven to 400 degrees. Take an entire head of garlic and cut off the white tops of the garlic and drizzle it with olive oil and sprinkle with salt. You are not peeling the garlic, you just want to cut off the tops to expose all the cloves. Wrap garlic in aluminum foil and bake for 35 to 40 minutes, until the head of garlic has caramelized (your house will smell incredible). Allow to cool and then squeeze out the garlic cloves. Before making hummus, reserve some of the liquid from the chickpeas and drain the rest of the can. In a food processor, combine the chickpeas, chickpea liquid, tahini, olive oil, lemon juice, roasted garlic, cumin and salt and pulse until smooth. Adjust salt, if desired. 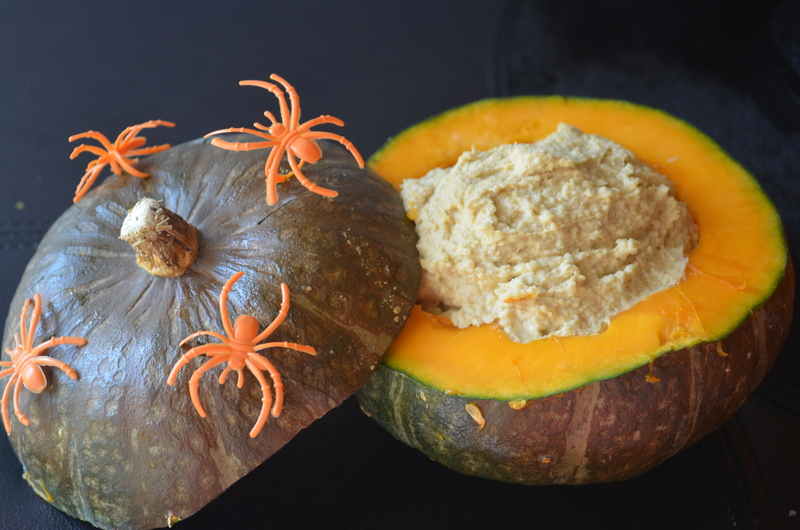 Cut off the top of the Kabocha squash and remove the seeds and any stringy flesh. Use a knife to cut thin slits around the outside of the squash top and even the base, if desired. Stuff plastic spider rings in these crevices or any other creepy ring. 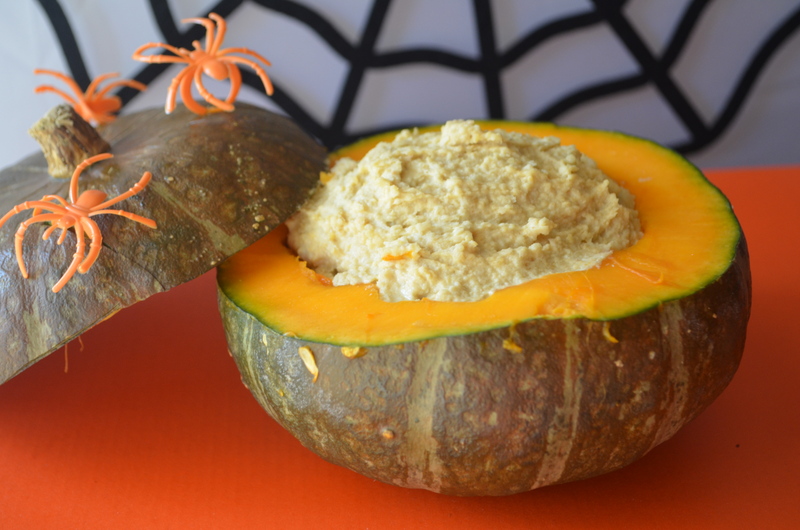 Fill the center of the squash with hummus. Serve with pita chips and vegetables. Tip: Serve the rest of the roasted garlic as a dip. Chop the cloves and add it to ½ cup of extra virgin olive oil. Warm it slightly (just slightly) on the stove top and add ½ teaspoon Italian seasoning, ¼ teaspoon rosemary and 2 tablespoons shredded Parmesan cheese, a dash of salt, and serve it with French bread. I couldn’t decide which way I wanted to style my photos this week. Black background or orange? Spider web or no spider web? Which do you prefer? 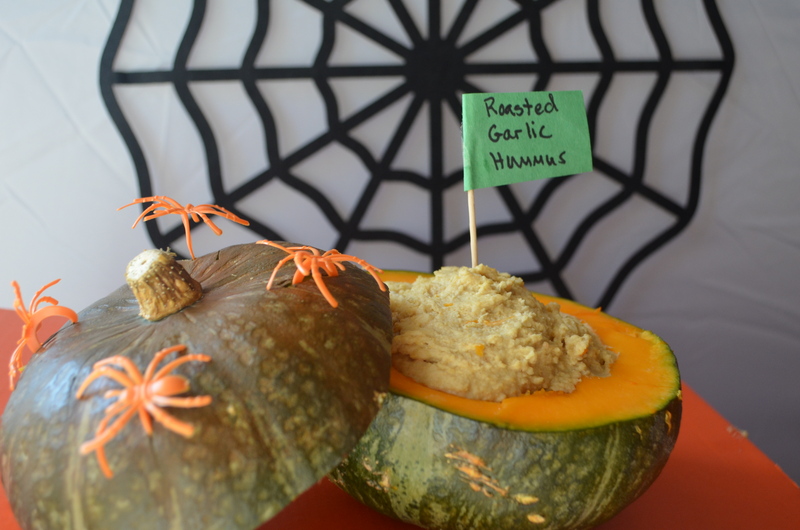 This entry was posted in Appetizers and tagged Appetizer, cheap, chickpeas, dip, Entertaining, festive, Halloween, healthy, homemade, hummus, Party, roasted garlic, spiders, spooky, tahini on October 22, 2015 by Juliana Goodwin. I love just about every type of hummus. When I was 9, I never thought I’d eat it again. My family lived in Sudan for about 8 months and the first two months we lived in a hotel. The hotel had the most limited menu so we eat hummus twice a day. I hated it by the end of that stay. I swore off hummus. It was so strong, too, incredibly heavy on the tahini. Well, I started eating it again in college and now I can’t get enough. Right now, I literally have homemade basil hummus, olive tapenade hummus, black bean hummus and a regular hummus in the fridge. I am not kidding. My husband eats it like crazy. Anyway, I came up with this hummus earlier this summer. This homemade hummus is always popular when I take it to a party. I don’t add fresh garlic to this hummus because I want the basil to shine. If you really love garlic, add one chopped, small clove. I serve it with warmed garlic Naan, instead of pita bread to add a kick of garlic (but pita works fine, too). It takes minutes to whip this up in the food processor and it keeps for several days, so you can make it ahead of time (which is great when entertaining). It’s even better the next day. Look how quick and easy this recipe is. Place all ingredients in a food processor and process until smooth. Serve with warm pita or garlic Naan, and sliced vegetables. This entry was posted in 10 minute recipes, Appetizers and tagged basil, chick peas, dip, fresh, garbanzo, healthy, homemade, hummus, labor day, lemon, tahini on August 27, 2015 by Juliana Goodwin.